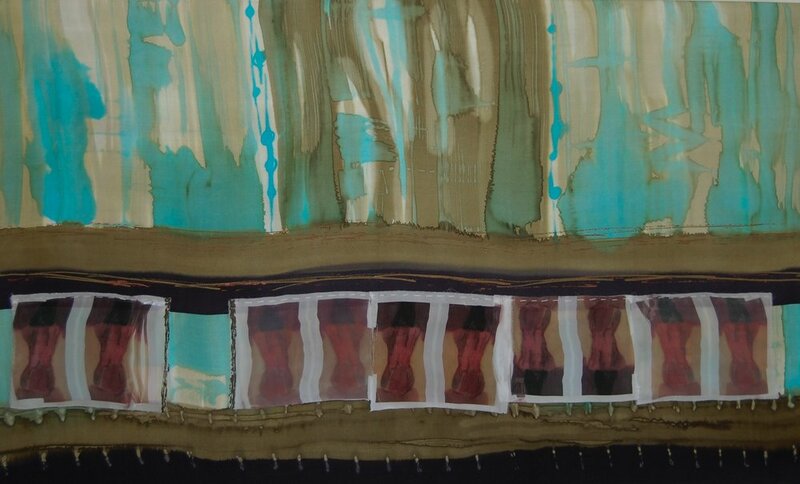 For July please meet artist Ellen Brook. I discovered my creative self when I was about 40. As strange as it might sound, the idea that I was an artist – let alone creative -- was a complete surprise to me and did not settle in overnight. Making this leap required loosening my ideas around who I thought I was. I’d say it was a spiritual discovery since it was sparked by a growing interest in meditation, the mind and the self. Basically, this new curiosity led to experimenting creatively and finding that I had a strong aesthetic and a naturally strong sense of how to harmonize through color, composition and emotional connection. 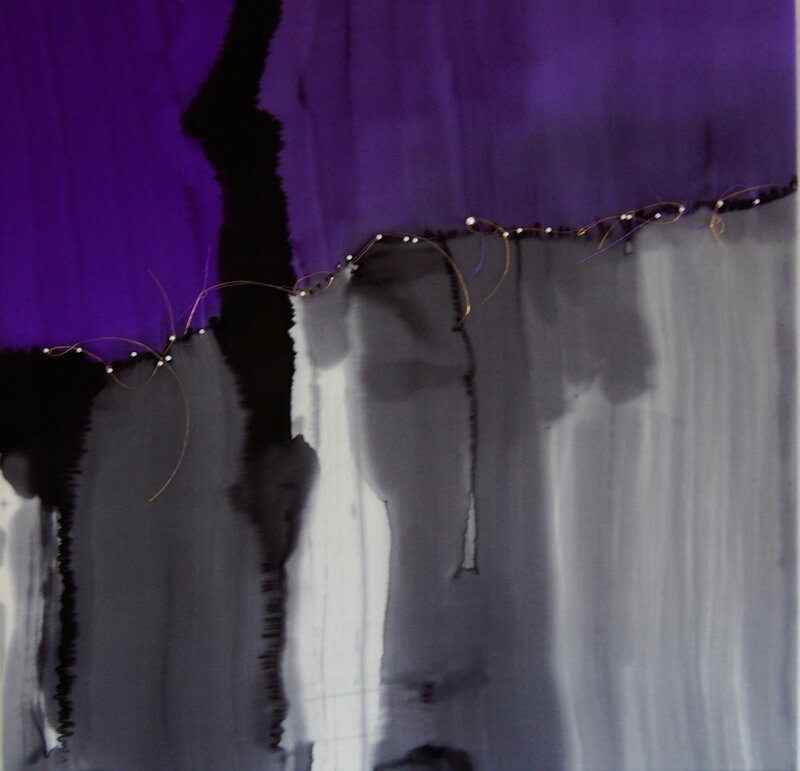 I was introduced to painting using dye on silk and I just resonated with it. One day I painted something that just felt so beautiful. I cried because I felt an enormous desire to bring forth beauty in a world full of darkness. It felt so purposeful. I keep evolving and playing. Being super playful with fabrics or cutting something up and reimagining it gets me fired up. Using new fabrics and new media is exciting for me. I like to change up things and move on. In general, for me it’s less about finding a creative zone and more about just showing up and doing the work. I am often working on multiple projects. On the fashion side, I am experimenting with many new natural fabrics beyond silk, including cottons, linens, and wools. It’s important to me to continue to express my own aesthetic, which goes far beyond silk. On the art side, I’m playing with some new media to see where my expression best takes hold. Creating art means freely experimenting with and expressing something that does not come from my rational mind. It’s a way to communicate. My language is one of visual poetry and my hope is to touch the edges of something I couldn’t otherwise – like beauty. It allows me to connect to myself and to others beyond the limits of ordinary language. In workshops with the kids of Kids & Art – I see my art as a powerful spark to ignite new possibilities for wholeness or healing or connection – or creative courage. In corporate settings, it can be used to inspire professional creativity while encouraging self discovery and collaboration – all vital elements of today’s emphasis on innovation and personal development. There are, of course, the practical difficulties of figuring out how to maintain creative joy and artistic integrity while making a living. Beyond that, because I came to this pursuit later in life, the challenge of stepping into a new part of my identity was quite a battle for me. After several years of painting without telling anyone, one day when I was out for a walk I felt something shift. It was mind blowing. Being artistic was no longer something ‘other’ than me. I was able to see that we are all creative and that I could freely accept my own aesthetic desires and sensibilities. I have read about the philosophy and approach of the glass artist Chihuly. He works the way that I do – and somehow that is comforting. I’ve always loved artists such as Georgia O’Keefe, Robert Motherwell, and the color fields of Mark Rothko. There are just so many artists and fashion designers whose creativity and aesthetic are inspiring. It may be cliché, but the joy or sense of excitement that someone gets when seeing my work or when wearing one of my designs is the most rewarding. I was once told that my work was ‘magic’; There is nothing better than the feeling of your art transforming someone’s space or spirit. It’s also great to unlock new creative possibilities for others. Either way, when my hands speak the language of the heart, I feel uplifted and touched. The 5 “P’s”: playfulness, persistence, patience, positivity and people (the ‘village’ you can go to for advice, or connection or support). Artistically, I feel right at home right now. I was so taken with the art and art galleries in Puerto Rico. Instead of security guards, they had docents standing at the ready to engage and answer questions almost the minute they popped into my mind. It was a completely exhilarating way to experience art. I don’t have a favorite color. Color is too important to me and I don’t want to discriminate! I keep evolving and playing. Being super playful with fabrics or cutting something up and reimagining it gets me fired up. when my hands speak the language of the heart, I feel uplifted and touched. We are all creative -- and may discover it at any time. 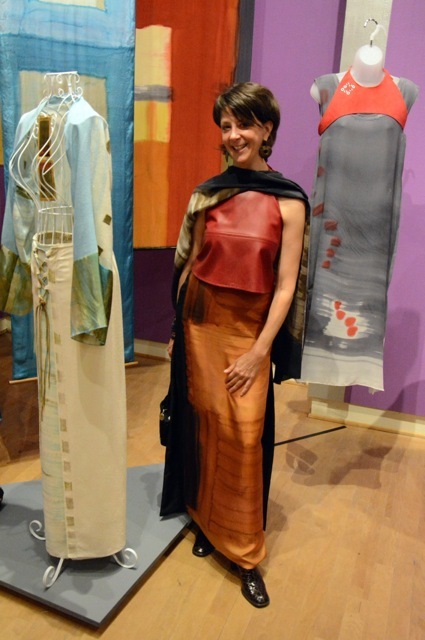 After a career in communications, Ellen Brook embarked on an artistic journey in her early 40’s and redefined her career to focus on art and fashion. 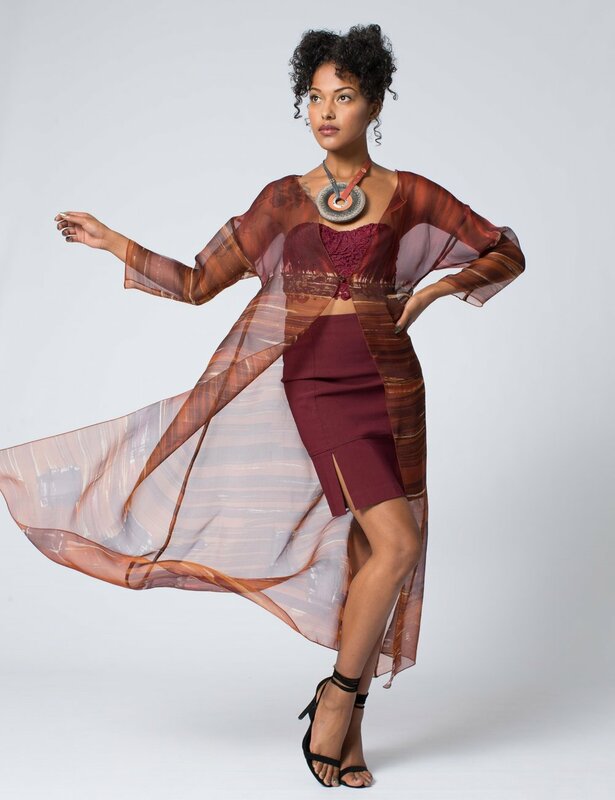 Ellen maintains an art practice, and designs apparel and accessories for women and the home that capture the artistry of her hand-painted designs on feel-fabulous fabrics. Ellen’s work has been exhibited in art shows, Bay Area runways, the media and independent design shows. Featured shows include “Uncommon Threads” at the Santa Cruz Museum of Art and History, and “ARTWEAR” at San Francisco’s de Young Museum. Ellen is on the Advisory Board of Cañada College’s Department of Fashion and Design.